Hello Kitty barbecued pork puffs (叉燒酥) - not such a good start. These were supposed to be shaped like Hello Kitty's head, but the poor girl was barely recognizable. They tried to fix this by using canape picks in the shape of Hello Kitty's head (only 1) or Hello Kitty's bow (the other 2). The filling was also starting to ooze out a little, which showed poor execution. Taste-wise this was OK.
Hello Kitty bow puffs (蝴蝶角) - once again, these didn't look like what we saw in pictures. They don't look anything like the bow on Hello Kitty's head, although taste-wise these were what one would expect from deep-fried minced pork dumplings (醎水角). 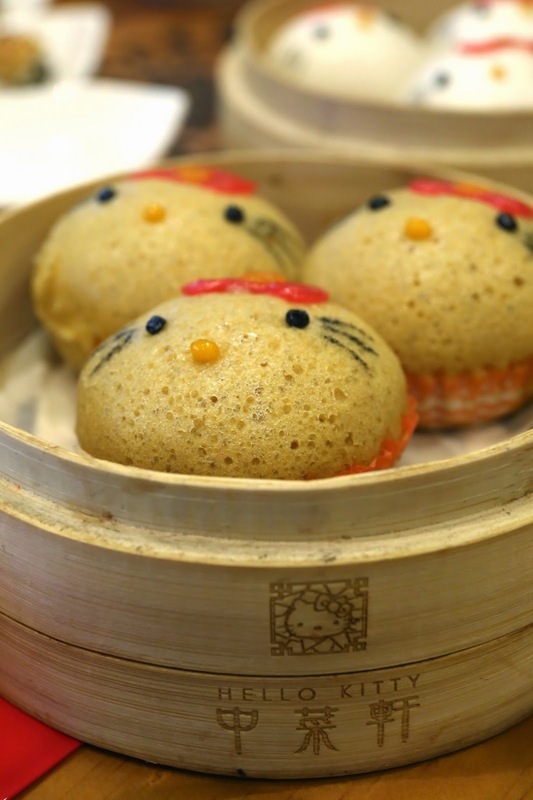 Hello Kitty custard buns with egg yolk (流沙包) - aren't these cute?! According to this CNN article, Hello Kitty's red bow is dyed with beetroot, nose is dyed with carrots, and eyes/whiskers black with squid ink. ...and then split her head in two. The custard and yolk filling was pretty good, I gotta admit. Hello Kitty steamed prawn dumpling (蝦餃皇) - although all four dumplings feature the red bow, only one had a drawn face. Taste-wise there isn't much difference between these and other prawn dumplings around town. Hello Kitty stir-fried beef noodles (干炒牛河) - I had read that this was one of the best-tasting dishes, and the reports were right. This was by far the best, and about as enjoyable as some of the better versions around town. Yup, they took the egg and made it into a bow. Hello Kitty diet stir-fried glutinous rice (健怡生炒糯米飯) - I thought this might fare better than the steamed rice, but I was wrong. I conveniently ignored the term "healthy" in the description, and this turned out to be pretty bland. All the ingredients - such as chopped spring onions, XO sauce, mushrooms...etc. were placed on the edges of the steamer, and I guess we were supposed to mix them up with the rice before serving. We were pretty full after all this food, and for the cost of around USD 20 per head, I'm not gonna complain too much about the quality of the food at this price. The cute dim sum items certainly didn't disappoint! A final word: While there is officially a no-reservation policy and tables are on a first come, first served basis, the restaurant does have a private room - appropriately named 林檎閣. 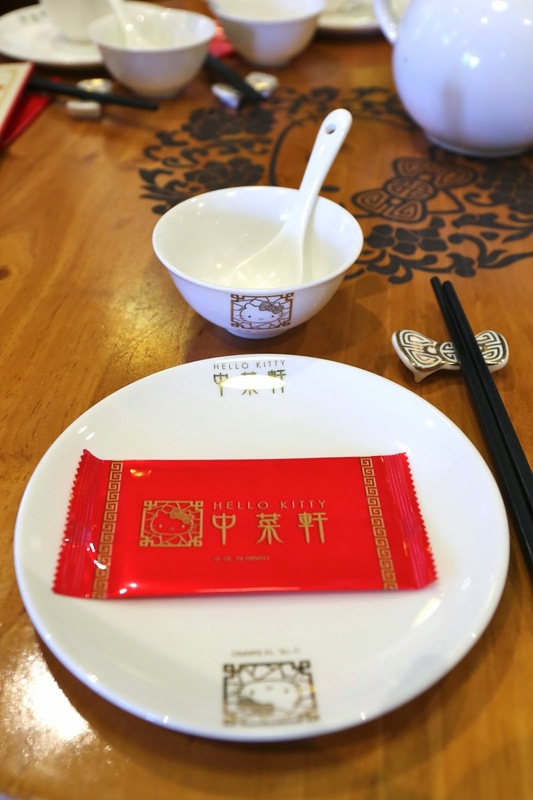 They do take reservations for a table of 12, with a minimum spending amount of HKD 5,000. Initially, we were wondering how it would be possible to spend that much money even with 12 people, when a whole chicken costs only HKD 238. But then we noticed that the daily seafood is charged at market price, and one can always order up a few bottles of the Hello Kitty wines - still wine charged at HKD 398 per bottle, sparkling wine at HKD 498 per bottle. Hell, I can even bring my own wines and pay HKD 150 for corkage. Could you please tell me why the private room is called 林檎閣? Thanks. 林檎is Japanese for apple. As any true Hello Kitty fan knows, apples are Kitty's favorite food.